If you are new to blogging or have been blogging for a while, you will notice that most bloggers recommend you start building an email list right away. But why you should start Building an Email List? We will tell you why you should start with this if you want to make money online. We will also recommend a few programs we use and that you can use to send out emails to your subscribers. Everyone has an email address. Most major social networks require an email address to create accounts, so we do know that email marketing is still extremely important. 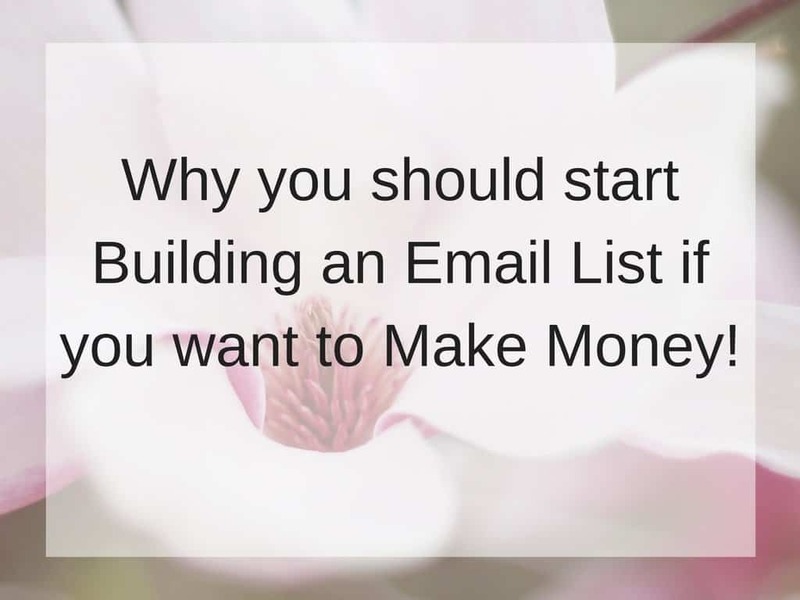 So why should you start building an email list if you want to make money online? It’s the best way to communicate with your potential clients. Email is still the most powerful way to communicate with anyone online. That’s one of the reasons why you should start building an email list from day one. Most people check their emails every day and even multiple times a day. You may post an amazing blog post today or share something interesting on social media. But what are the chances that everyone will see it? If you want your work and announcements to be seen, consider adding email marketing to your mix. Sending a weekly newsletter to your subscribers with important news and latest articles will ensure more people outside your social networks see it as well. This will increase your Pageviews, chances of more sales and it’s easy to stay in touch and connect with your client. Email is the best way to stay engaged with potential buyers. 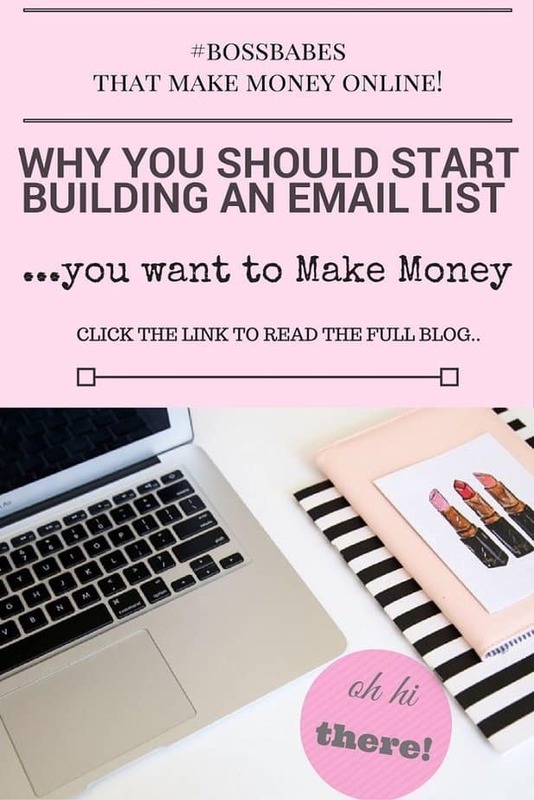 If you are really considering monetizing your blog then building an email list is essential to your success. If a potential client subscribes to your email list, then they know that you offer valuable content and are willing to receive notices from you once in a while. These clients are totally engaged with your work and are ready to hear more from you. Having 1000 followers on Instagram or Twitter does not mean that they are loyal clients. You must start building an email list right away in order to be successful and to see continuous growth in your online business. Once you start getting subscribers ensure you look after them as these are your loyal fans and future buyers. They will share your work because they trust you and this means more eyes on your work. Your email list will last forever. If Facebook or Instagram decide to shut down today like My5 did several years ago, then you will be out of business. Don’t get us wrong, we love social media and it’s the best way to attract more clients, it drives traffic back to your blog and it allows you to connect with clients on a personal level. But it can all disappear one day. With an email list, you have full control for your business. You won’t just randomly lose all your subscribers unless they choose to unsubscribe from your list for some reason. Social media also has the tendency to change its algorithm which means you have to pay to promote your posts so more people can see it. With an email list, you send them what you want them to see without much effort. We showed you the benefits of why you should start building an Email list and why it’s the best way to communicate with your audience, how it’s beneficial once you decide to start selling products and how it can increase your page views if you share your latest blogs and news. Without an email list, your online business won’t go far and may end up failing. To ensure your success consider starting your email list right away. So how do you go about building an engaged email list? Once you are ready to start building an email list, you must sign up to a good email platform like (Aweber or Mailchimp). Aweber has a free trial you can use for 30 days and it is easy to use. You are able to create email sequences that you can set and it will work on autopilot for you. Mailchimp is FREE for the first 2000 people but it is limited on what you can do. You can not schedule email sequences as easily unless you upgrade. Your aim is to grow as fast as you can in order to make money. Melyssa Griffin’s course which I took, helps you grow your email list extremely fast. You can register for the course here! Use Leadpages to create your sign up forms. Since using Leadpages in my previous blogs, my sign up rate doubled in the first month. It is designed to attract clients and increase the chances of someone subscribing. Offer content upgrades or incentives to encourage sign ups. Every blog you put out should have a content upgrade or some sort of incentive to encourage your audience to sign up. An example of something you can offer is “FREE E-BOOK TO GROW YOUR AUDIENCE”. You are giving your clients something in return for their email address. This is a win/win situation for you. Do you have an email list? How successful are you? Tell us below, we would love to hear your feedback on how successful you are. Have we answered your question on why you should start building an email list if you want to make money online? If you have any questions, tell us below. Do you agree with our reasons on why you should start building an Email list? I knew I needed to start building a list right away but didn’t. Four years into blogging and my list is so very small because I never invested time into building. Such a waste. But, my goal for 2017 is to focus on building my list. I’ll have to pin this to come back to later. 4 years wow! You must have lots of great content. Go ahead and update them with content upgrades and re share. With a list, your marketing is so much easier and not as time consuming! This has been on my list to do forever! Hoping to get it started soon! I am working on this for the past 2 or 3 months. I’m so glad I stopped avoiding it, because it’s really not so bad. I’m working on finding valuable, yet simple content to send out to my subscribers. You will get there. Never give up on your goals. Just tweak whats working and what’s not working. I never thought to build an email list right away. Very good insight as to where to start and then how to start following up once you start building your list. Thank you for stopping by Samantha. An email list will make or break your online business. I am glad you found the information useful!